The Providence has Power Gear Electric jacks and worked perfectly for 5 years on the road. The left rear jack became intermittent during our trip to the Canadian Maritimes last year and finally quit completely November 2013 when retracting them at the end of our stay in Navarre, FL. Fortunately, the jack quit in a fully retracted position. This is long but important to learn about many issues from service quality to service options as well as Power Gear Electric Jacks on motorhomes. The Power Gear system consists of an automatic level controller, 4 all electric jacks with motor and brake. The controller senses the position of the jack full up or full down with a magnet embedded in the jack staff. This is to stop extension at its maximum and stop retraction when full up by applying a brake attached to the motor. When a jack fails it is most likely (~98% of the time) caused by a bad brake, it gets corroded and finally just locks up. Why corrosion? Because the brake is mounted on the bottom of the motor and covered with a rubber boot. Mounted directly behind the rear wheels, it is subject to all kinds of dirt, debris and WATER when travelling in wet conditions. If the top of the boot is not sealed, it will leak water which eventually corrodes the metal parts in the brake and it locks up. The photo on the right shows the motor (yellow) and brake (black boot over the break at the bottom). 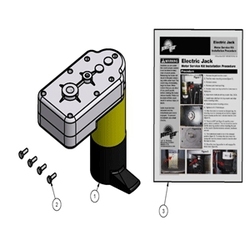 Continue reading Power Gear Electric Jacks: Brake Rebuild Gone Bad. 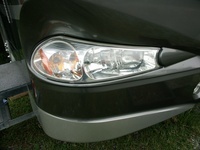 Headlight Restoration Product Really Works! After three years traveling the country full time in the Providence, the headlights were looking dim and cloudy. I purchased the Mothers PowerBall 4Lights Headlight Restoration All-In-One kit at a local auto parts store. I had high hopes that it was going to work but was cautiously optimistic. 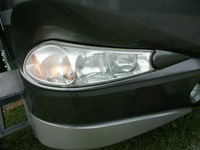 Continue reading Headlight Restoration Product Really Works!. Back in August, 2009 attending the FMCA regional rally in Burlington, VT, I was convinced to add an after market tire pressure monitoring system to the Providence. 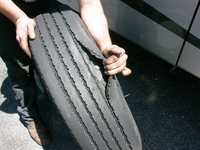 A tire blowout or other loss of pressure on a 32,000 lb vehicle could be a disaster to the motorhome or tow vehicle. In addition to alerting to a potential tire problem, I would always know my tires were set to the right pressure for load safety, tire wear and fuel economy. The system purchased was from Pressure Pro. Continue reading After market pressure sensors on our motorhome averts potential disaster.